Bed bugs have, and likely always will be, a worldwide problem. These little pests that are known to infest homes, hotels, motels, apartments, dorms, and more — no matter how clean — are unfortunately apart of our human history. Now, with the worldwide improvements which have lead to an increase in travel around the globe, both in convenience and accessibility, bed bugs have again been brought to the forefront of the international scene. Which brings us to the eternal question: What is the fastest way to get rid of bed bugs? Chemicals have long been the primary methodology, going as far back as the World War II Era, with DDT (Dichlorodiphenyltrichloroethane) emerging as one of the most common and effective, yet problematic, chemicals used. Since then, the new chemicals have emerged on to the scene as hopeful solutions, though many of them have been found to be less effective on bed bug infestations. The latest research in the pest control industry has confirmed many disturbing facts, namely revolving around the revelation that many strains of bed bugs have developed a resistance to chemical treatments over the years, while others have simply evolved to grow a thicker cuticle, or outer layer, which makes chemicals unable to penetrate the insect and therefore be rendered ineffective. Now, the chemical companies are suggesting stronger mixtures and higher doses, neither of which are healthy nor effective. In fact, many countries are growing more aware and concerned about the use of these chemical pesticides and their effects on the public, particularly because these pesky bed bugs inhabit sleeping areas used by residents, guests, and other folks for up to a third of each day. Furthermore, the use and administration of these chemicals often requires expensive, inconvenient licensing, which has sparked scrutiny and a growing movement to issue legislation in order to curb, inspect, refine, and eliminate their use. Industry research, experts, and common sense has shown that heat treatment to kill bed bugs is a simple, effective, and economical means to destroy them in all stages and in all harborages. Heat treatments does this without the problematic issues associated with chemicals, including health risks, licensing, and the added inconvenience of being put out of the room for extended periods. Studies have indicated that temperatures between 48.3 degrees Celsius (118.94 Fahrenheit) and 49.4 degrees Celsius (120.92 Fahrenheit) kills these pesky bed bugs in all stages of life. Now, sustaining temperatures at, or above, this critical threshold for several hours ensures that the heat properly penetrates the favorite hiding spots of bed bugs, including hard-to-see crevices, headboards, mattresses, picture frames, baseboards, night stands, and nearby furniture. 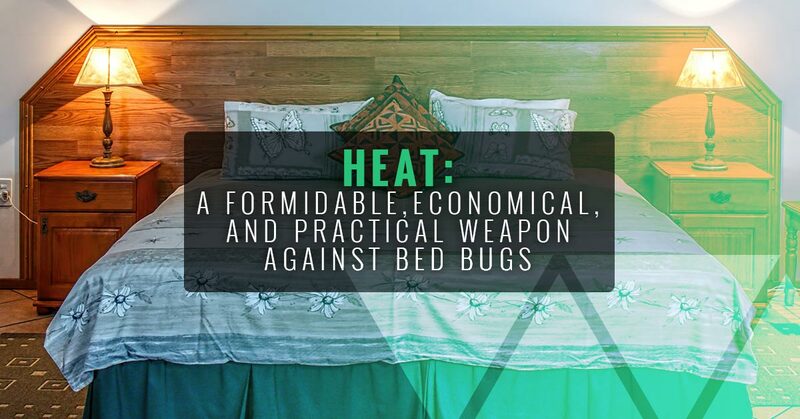 The initial heat exposure essentially paralyzes bed bugs, which prevents them from scurrying, while the sustained heat eliminates their ability to survive altogether. The key to this process is heated airflow, specifically the convection effect, which is similar to cooking a turkey in a convection as opposed to a traditional oven. Heated airflow allows you to penetrate the entire room, rather than just one spot, meaning you can kill all of the bed bugs located in a single room and in all stages of life, including eggs. Here are some more reasons why heat is the most effective and fastest way to kill bed bugs. More Effective: Studies show that it takes, on average, around 1.3 visits with heat treatment to fully control bed bugs. That means you need as little as half as many treatments as if you were using chemicals, which on average requires 2.6 visits by a licensed professional. Furthermore, heat is discreet, not visible, and has no residual odors. Fast Turnaround: After utilizing heated airflow to kill bed bugs, the previously infested room is immediately habitable, as opposed to chemical treatment which requires a room to be out of service for multiple days. When it comes to hotels and other facilities, that means heat treatment is more friendly to your bottom line, as you can begin renting out that room as soon as treatment is complete. Chemicals, meanwhile, cause an infested room to be out of service for between three and 10 days, meaning a massive loss of revenue for hotels and the hospitality industry. No License Required: Heat treatment and the use of electric bed bug heaters doesn’t require any special or costly licensing. Employees, employers, home owners, and facility managers, can all be trained to use heat to kill bed bugs effectively, as well as to enforce pre-treatment and posttreatment protocols to ensure total eradication and prevent re-infestation. Less Risks: Chemicals are known to be harmful, or even toxic, to humans and animals. Heat, meanwhile, produces no additional risk to humans, animals, or nearby residents. It is not recommended that people be in the room throughout the treatment, however. Great Return: An electric heater to kill bed bugs can be used for years and will pay for itself many times over, as opposed to chemical treatments which are often less effective, require multiple visits, and rack up the costs. In conclusion, it’s obvious that bed bugs are here to stay. These pesky hitchhikers don’t discriminate when it comes to who they ride along with, meaning they can be found in even five-star hotels, private homes, college dorms, and everywhere in between. It’s up to us to be vigilant and smart when it comes to combating bed bug infestations. If you’re looking for the fastest way to get rid of bed bugs, contact Colorado Tri-Flo Systems to learn about our many electric heater options.